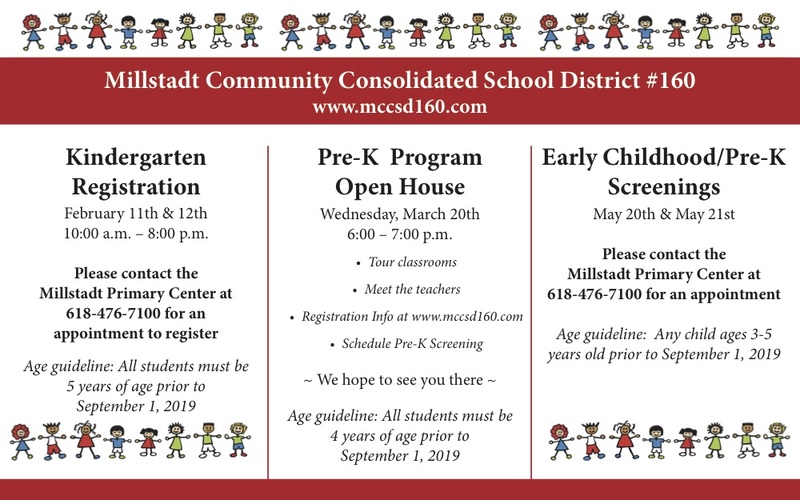 Millstadt Community Consolidated School Kindergarten Registration. February 11th & 12th. 10:00 a.m. – 8:00 p.m. Please contact the Millstadt Primary Center at 618-476-7100 for an appointment to register. Age guideline: All students must be 5 years of age prior to September 1, 2019. Wednesday, March 20th. 6:00 – 7:00 p.m.
Age guideline: All students must be 4 years of age prior to September 1, 2019. Please contact the Millstadt Primary Center at 618-476-7100 for an appointment. Age guideline: Any child ages 3-5 years old prior to September 1, 2019.